Our product range includes Dynamic Positioning Sytems, Ship lift & transfer systems, ship Design, lifeboats and many more. We also manufacture our own specialized scientific sampling equipment that is exported and used onboard the worlds & India’s premier research vessels. Through our joint venture with Maritime Montering in Norway, we provide Installation of complete turnkey marine accommodation systems for ships and offshore rigs in the Indian subcontinent. We can proudly say that in the short time of establishment we are THE most successful turnkey marine accommodation company in India. Please browse through our Marine products through the category’s below or browse through our entire product list listed alphabetically. 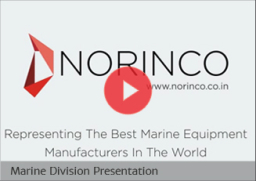 Norinco represents highly specialized and Niche manufacturers for land based industry usage. All these companies are leaders in their field., be it Hydrogen Generation, Graphite/ carbon products, thermal insulation or extremely high tech, wafer producing equipment.